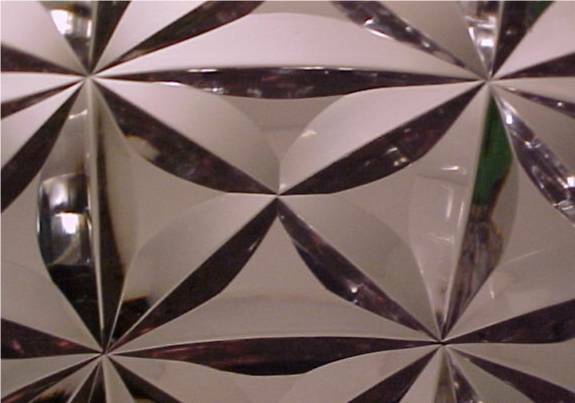 Deeply cut miters form large-scale triangles and crossed ellpticals in the following example. 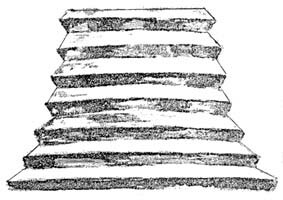 They provide the outline for a cluster-type pattern on a dish with turned-over sides. The gleaming surfaces reflect the care that was taken in the smoothing and mechanical polishing of the miter cuts. No acid was used. 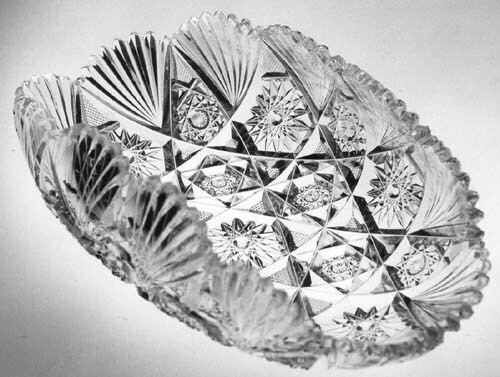 In addition to miter-cut fans, used here as fan scallops, motifs include two types of hobstars as well as Brunswick stars and strawberry (fine) diamonds. 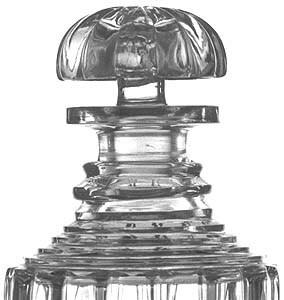 Quality cut glass from an unknown American manufacturer, c1890. L = 10″ (25.4 cm), H = 3.75″ (9.5 cm), wt = 3 lb (1.4 kg). Sold for $200 in 1982. This example is of particular interest because it illustrates a pattern produced by the Smith Brothers company of New Bedford, MA (c1885-c1895). The writer once had a small rose bowl in this pattern that matched the illustration that Revi uses in his brief discussion of this company (Revi 1965, pp. 61-2). The author’s example had the following specifications: D = 4″ (10.1 cm), H = 3.5″ (8.9 cm), wt = 1 lb (0.5 kg). The rose bowl sold for $75 in 1986. 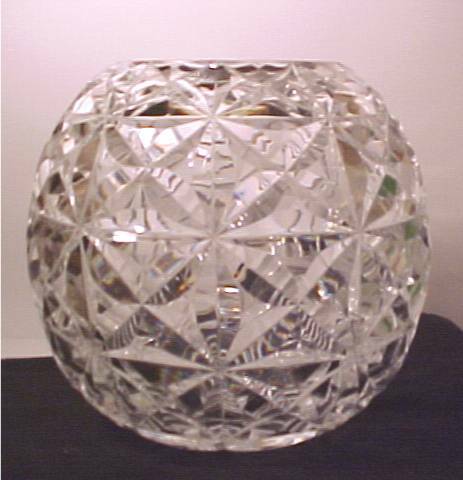 More recently, this pattern, which was probably unique to the Smith Brothers, appeared on the Internet on another rose bowl, as shown here, D = 8″ (20.2 cm), H = 8″ (20.2 cm). It sold for $350 at an eBay auction in 2006 (Images: Internet). 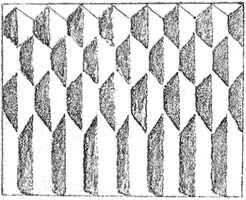 Blaze, also called fringe, consists of narrow, shallow miter cuts of equal or — as illustrated here — variable length. 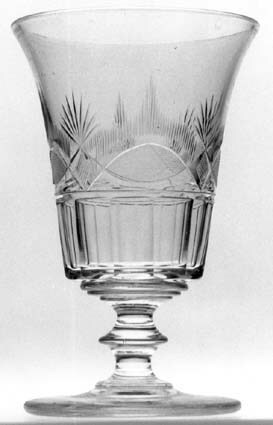 Early American celery vase attributed to Bakewell, Page and Bakewell of Pittsburgh, c1825. Ground and polished pontil. H = 8″ (20.3 cm), rim D = 5″ (12.7 cm), foot D = 4.25″ (10.8 cm), wt = 2 lb (0.9 kg). Sold for $175 in 1989. Blaze is seen (faintly) as an upside-down “beard” attached to the vesica of the vesica-and-diamond pattern which is said to have been a popular Pittsburgh design (Innes 1976, p. 138). The V-cuts forming the pattern are asymmetrical in cross-section, an early-cutting characteristic. LEFT: Blaze (fringe) was used by William C. Anderson in several patterns cut at his American Cut Glass Company at the beginning of the twentieth century. This is a detail from his “Lansing” pattern (patent no. 36,739). 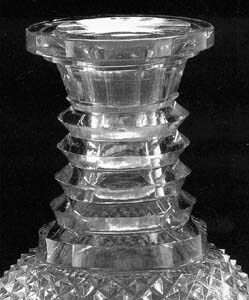 Blaze, as used by Anderson, is often incorrectly called “flashing” by today’s collectors who ignor both the history of the blaze motif and the use, in cut glass, of “flashing” as proposed by J. Michael Pearson in the 1960s. 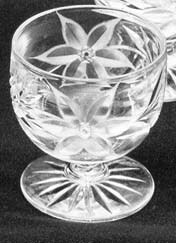 RIGHT: A pedestalled, handleless punch cup cut in the “Star Flower” pattern patented (no. 44,875) by the Ideal Cut Glass Company in 1913. 16-pt star on foot. H = 3.25″ (8.2 cm), max D = 2.75″ (7.0 cm). A set of four cups sold for $50 at an eBay auction in 1998. The flower’s petals are outlined with very finely engraved blaze. 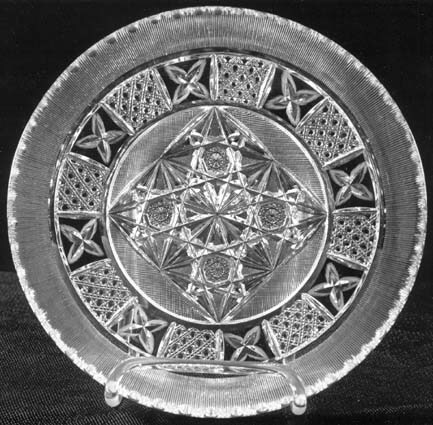 A popular pattern, “Star Flower” was produced on a large variety of objects. Similar patterns, of variable quality, were cut by other companies. When blaze is extended in length and is unpolished or given a “low” polish, it is called silver threads, a term possibly first used by H. P. Sinclaire & Company in the name of its patented Diamonds and Silver Threads pattern of 1913 (patent no. 44,774), but the motif was probably used earlier. Although proprietary names should not be used for cut-glass motifs, silver threads is an exception. It is difficult to find a name that would be equally appropriate. 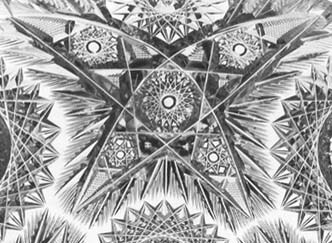 Plate cut in a pattern that includes a border of silver threads and blazed Xs. Central motif is Russian-Persian with a Brunswick star (unusual). C1910. D = 10″ (25.4 cm), wt = 3.25 lb (1.5 kg). Sold for $450 in 1989. A photograph of a duplicate plate was published more then thirty-five years ago (Pearson 1965, p. 115), yet the manufacturer remains unidentified today. The pattern has some Tuthill characteristics. Incidentally, the number of silver threads was counted and written on a scrap of paper which is now lost. The writer believes the number to be 540 (with each thread individually engraved!). Would someone like to confirm this figure?